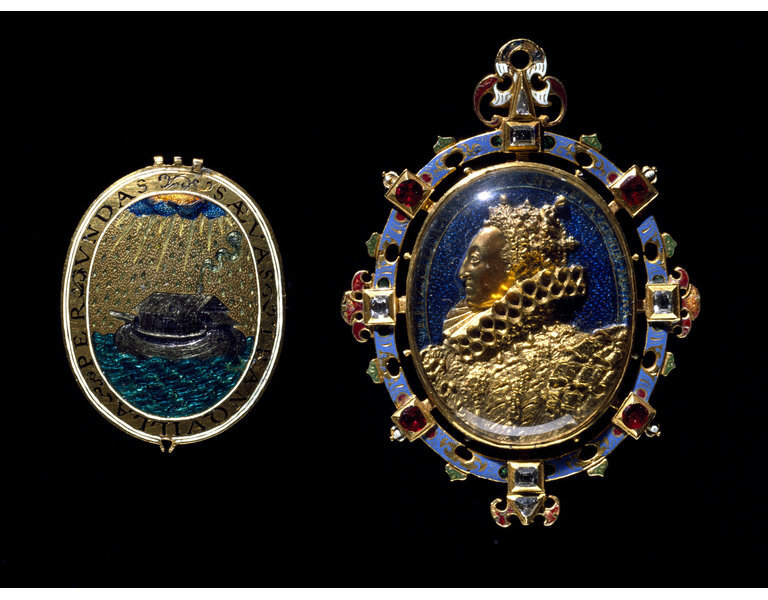 The Heneage Jewel is decorated with a profile portrait of Queen Elizabeth I (1533-1603) in gold. On the reverse is an image of a boat sailing peacefully on stormy seas which is intended to represent the Church of England, steered by Elizabeth, weathering religious turmoil. The jewel is actually a locket. 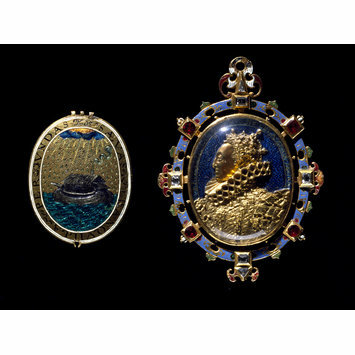 By tradition, the Queen gave the jewel as a gift to her loyal and active courtier Sir Thomas Heneage, but it may be that she gave him only the miniature painting of herself which is inside the locket. The painting is by Nicholas Hilliard (1537–1619), one of the greatest artists of the Elizabethan era. 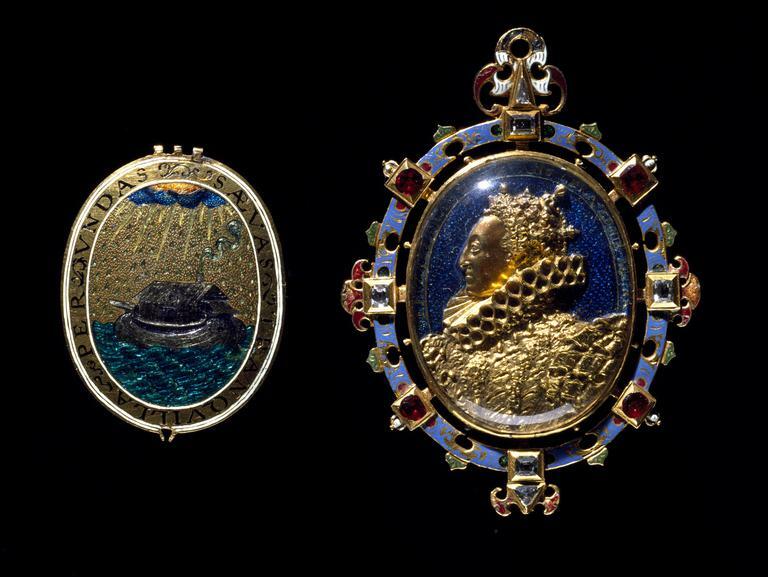 Sir Thomas may have had the superbly decorated locket made to show his devotion to the Queen. Her beauty is praised in an inscription inside. Sir Thomas Heneage was a Privy Counsellor and Vice-Chamberlain of the Royal Household. He was appointed Chancellor of the Duchy of Lancaster in 1590. The Heneage Jewel has sometimes been called the Armada Jewel. However, it was probably made in about 1595, some years after the defeat of the Spanish Armada in 1588. Enamelled gold, set with table-cut diamonds and Burmese rubies. Obverse, a bust in gold under rock crystal of Elizabeth I, apparently a version of the Garter Badge of about 1585, surrounded by inscription. Inside, a miniature of the Queen by Nicholas Hilliard. The hinged back of the locket is enamelled outside with the Ark of the English Church on a stormy sea and an inscription. The back of the locket is enamelled inside with a Tudor rose encircled by leaves and an inscription. According to tradition, the jewel was given by Elizabeth I to Sir Thomas Heneage (died 1595), a Privy Counsellor and Vice-Chamberlain of the Royal Household. The jewel remained in the possession of the Heneage family until 1902. The inscription 'Hei mihi quod ...' appears on the reverse of the Phoenix medal of 1574. Hilliard was the painter of the miniature which is enclosed within the jewel.